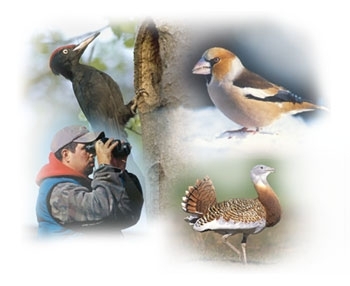 Welcome to Hungarian Bird Tours. The large and extensive oak, beech and Hornbeam forests are home to eight species of woodpecker and four species of eagle. In addition the more scrubby areas are alive with the song of nightingales. Red backed shrike now extinct as a breeding bird in Great Britain are still widespread and common in this part of hungary. Hungarian Bird Tours is run by Roy Adams, a retired police wildlife crime officer who served almost thirty two years with the Devon and Cornwall Constabulary. Staying at the newly opened Villa Volgy Hotel in Eger, visitors take advantage of the Crystal clear air, a quiet environment and a calm atmosphere. Relax in this high-quality, three-star hotel. There are two, three and four-bedded rooms, each with a bathroom, phone, refrigerator and colour tv. Whats Different About the Holiday. Being ideally situated within easy reach of a wide variety of different habitats travelling times are short allowing more time to walk through the forests and round the many lakes. With Roy living in the area this eliminates the threat of the holiday being cancelled due to lack of numbers. Tours will run with a minimum of 2 people with a maximum of 12 and are available all year. The hotel Villa Volgy is situated on the edge of Eger (approximately 15 minutes walk from the centre) with open woodland and vineyards behind and Hungary's most famous wine valley to the front with its many cellars (glass of red wine for 10p). The hotels grounds and immediate surrounds having breeding scops owl, Syrian Woodpecker, golden oriol and hawfinch to name but a few.